Yes, so if I decide to do that I will have to re-install them. I would rather do a full uninstall/reinstall in that case..The reason I am asking here is to find a solution through experience or expertise instead of wipping everyhing out. That is my last resort. A quick way of locating these is to Copy the Text below and Paste them into your windows search bar, One by One and click on the result, this will bring you directly to the correct locations. 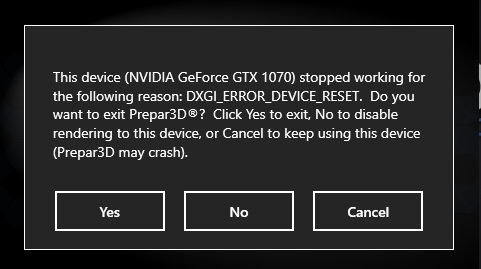 I clicked 'Yes' and came here to find out in the forums what this means and how I can fix it. Thank you very much for the suggestion Elaine. I will try this and follow up here. I think it works better now. I still get cursor freezes, but it freezes for much less time and so far I haven't got a blackout screen. Have started the sim a number of times so far.. I will report again if the blackout problem comes back. I hope this will solve it. Thank you Elaine. I use the 416.34 Nvidia drivers. Haven't tried the new ones yet. Right now the problem is completely resolved. While P3D is loading there seems to be no performance impact on my workflow, no mouse freezes, no screen blackouts. P3D is loading completely silently until I see the scenario screen, which is how it should work. Just out of curiosity, installed the latest nvidia drivers and it is still fine here. Uninstalled using the DDU uninstaller. What seems to solved it in my case was a combination of P3D Repair (thanks to martyson), delete Prepar3D.cfg and Shaders (thanks to Elaine) and uninstalling the Aorus GPU application.